Through our online shop - British Roses - we supply hand-selected special occasion gift roses. These are available all year round. Our potted rose gift sets therefore make a perfect gift. We have roses for Birthdays, Weddings, Engagements, New Baby Gifts, House Warming, Retirement and Remembrance, and not forgetting Valentine’s Day, Mothers Day and Father’s Day roses. All our Gift Set Rose Bushes are potted, presented in a ribbon-tied hessian bag and safely packed in a strong cardboard container to ensure that they arrive in pristine condition. Included in the price is a greetings card with your personal message. Also, each potted rose is supplied with an attractive coloured label with a picture and description of the rose. 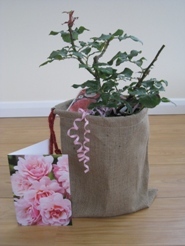 A great gift idea for that special father, son, brother, uncle, boy or friend - Birthday Boy Potted Rose delivered by mail order and presented in a ribbon-tied hessian gift bag with gift card with your personal greeting. A large flowering hybrid tea rose. Large, exceptionally fragrant, lilac blooms are produced early in the growing season and regularly repeats until first frost. Strong, healthy growing habit with very good disease resistance. Grows to 90cm in height. Hardy. Fantastic birthday present for a man or boy. A great gift idea for that special mother, daughter, sister, niece, girl or friend - Birthday Girl Potted Rose delivered by mail order and presented in a ribbon-tied hessian gift bag with gift card with your personal greeting. A small flowering floribunda rose. Cream edged carmine pink blooms are produced in abundance throughout the flowering period. Lightly fragranced blooms. Glossy medium green foliage. This rose can be grown in a pot or at the front of a border. Looks stunning grown as a small rose hedge. Ideal as a birthday present for that special lady. Good disease resistance. Hardy. Grows to 90cm in height. A great gift idea for that new baby, wedding, birthday or special occasion - Blessings Potted Rose delivered by mail order and presented in a ribbon-tied hessian gift bag with gift card with your personal greeting. An attractive salmon/pink coloured hybrid tea rose. Slightly fragrant, medium sized flowers are produced abundantly throughout the season on healthy vigorous growth. Flowers keep their attraction even in rainy weather. Ideal rose for beds and borders. Good disease resistance. Grows to 100cm in height. Hardy. A great gift idea to wish that special couple congratulations on that special wedding occasion - Bride & Groom Potted Rose delivered by mail order and presented in a ribbon-tied hessian gift bag with gift card with your personal greeting. A large flowering hybrid tea rose. Dark pink buds open to slightly scented, high centred blooms baby pink in colour. Blooms are produced singly and in clusters of up to five blooms. Strong upright vigorous growth. Young foliage is a highly attractive bronze-red maturing into a pleasing semi glossy olive green. The colour and name makes this rose the Ideal wedding gift. Hardy. Good disease resistance. Grows to 100cm in height. A great gift idea for an Anniversary, Birthday, Engagement, New Baby, New Home, Retirement, Special Occasion and Wedding - Champagne Moment Potted Rose delivered by mail order and presented in a ribbon-tied hessian gift bag with gift card with your personal greeting. ROSE OF THE YEAR 2006. This large flowering floribunda variety bears large old fashioned shaped blooms throughout the summer. Softly scented flowers start Apricot in colour fading to cream with age. Healthy dark green glossy foliage presents the flowers well. A great name for that special occasion. Hardy. Good disease resistance. Grows to 120cm in height. A great gift idea for an Anniversary, Birthday, Engagement, New Baby, New Home, Retirement and Wedding - Congratulations Potted Rose delivered by mail order and presented in a ribbon-tied hessian gift bag with gift card with your personal greeting. A large flowering, slightly fragrant hybrid tea rose. Large well-formed pink flowers are produced throughout the growing season on tall stems. Medium green glossy foliage. Ideal for cutting and can be used for hedging. Good disease resistance. Hardy. Grows to between 120-150cm in height. A great gift idea for an Anniversary, Bereavement, Birthday, Father's Day, Friendship, Grandparents Day, Mother's Day or Pet Memorial - Dearest Potted Rose delivered by mail order and presented in a ribbon-tied hessian gift bag with gift card with your personal greeting. A cluster flowering floribunda rose. Beautiful salmon pink, camellia like blooms with a spicy fragrance are produced in large trusses throughout summer into the autumn. The bush is clothed in dark and shiny foliage. A vigorous branching growing habit. A good choice of rose for bedding, cutting and exhibiting. Spray regularly against disease. Hardy. Grows to 75 cm in height. A great gift idea for an Anniversary, Birthday, Christmas, Engagement, Father's Day, Friendship, Grandparents Day, Mother's Day, New Baby, New Home, Retirement, Sorry You're Leaving, Special Occasions, Thank You or Wedding - Especially for You Potted Rose delivered by mail order and presented in a ribbon-tied hessian gift bag with gift card with your personal greeting. A large flowering Hybrid Tea rose. Large well-formed blooms of a beautiful Mimosa Yellow with a hint of pink are produced singly and in clusters throughout the summer into the autumn. A strongly scented variety with dark green glossy foliage. Ideal gift for that special person. Good disease resistance. Hardy. Grows to 100cm in height. A great gift idea to remember that special person, special event or pet bereavement - Fond Memories Potted Rose delivered by mail order and presented in a ribbon-tied hessian gift bag with gift card with your personal greeting. A repeat flowering patio rose. Small clusters of petit ginger-orange blooms fading to apricot with a glowing yellow centre are produced repeatedly throughout the summer into the autumn. Dark green and glossy foliage provides a perfect backdrop for the flowers. Petit and compact growing habit. Ideal as a memorial rose. Hardy. Good disease resistance. Grows to 30cm in height. A great gift idea for that 50th wedding anniversary - Golden Wedding Potted Rose delivered by mail order and presented in a ribbon-tied hessian gift bag with gift card with your personal greeting. An excellent memento to mark 50 years of marriage. An attractive floribunda rose producing well shaped, fragrant blooms of golden yellow. Clothed well with very attractive, glossy dark green foliage. A vigorous upright growing habit. A healthy and easy to look after variety. Good disease resistance. Hardy. Grows to 80cm in height. A great gift idea for that special wedding anniversary or other memorable day - Happy Anniversary Potted Rose delivered by mail order and presented in a ribbon-tied hessian gift bag with gift card with your personal greeting. A perfect gift for someone celebrating a wedding anniversary. This compact and bushy variety bears large clusters of large, fragrant deep pink blooms. The blooms contrast very well with the deep green glossy foliage. Perfect for mass planting. Hardy. Good disease resistance. Grows to 75-90cm in height. A great gift idea for that special person retiring from work - Happy Retirement Potted Rose delivered by mail order and presented in a ribbon-tied hessian gift bag with gift card with your personal greeting. A cluster flowering floribunda rose. Masses of bright pink blooms are produced repeatedly through out the summer into the autumn. Beautiful delicate scent. Foliage is dark green and glossy. A very healthy and disease resistant variety. This rose makes the perfect gift for that someone who is retiring. Hardy. Excellent disease resistance. Grows to 60-90cm. A great gift idea for that 40th wedding anniversary - Happy Ruby Wedding Potted Rose delivered by mail order and presented in a ribbon-tied hessian gift bag with gift card with your personal greeting. A mass flowering Hybrid tea rose. A stunning display of elegant, sweetly scented, bright ruby red flowers produced en-masse throughout the summer into the autumn. A strong, upright and vigorous growth habit. This rose makes the perfect gift for that special couple celebrating their Ruby Wedding. Hardy. Good disease resistance. Grows to 90cm in height. A great gift idea to give lasting memories of that special person - Loving Memory Potted Rose delivered by mail order and presented in a ribbon-tied hessian gift bag with gift card with your personal greeting. A large flowering Hybrid Tea rose. Large, red, well-shaped, slightly scented flowers produced from late spring to first frost. Dense, dark green semi-glossy foliage. Long straight stems make this rose ideal for cutting and exhibiting. An Ideal rose for every garden. Hardy. Good disease resistance. Grows to 90-120cm in height. A great gift idea to wish someone special congratulations or for any other special occasion - Lucky Potted Rose delivered by mail order and presented in a ribbon-tied hessian gift bag with gift card with your personal greeting. A great gift idea for a birthday for that very special person - Many Happy Returns Potted Rose delivered by mail order and presented in a ribbon-tied hessian gift bag with gift card with your personal greeting. A cluster flowering floribunda rose. Large, fairly open, fragrant blooms of blush pink are produced fairly early in the spring. Medium green glossy foliage. A nice spreading habit, producing attractive hips in the autumn gives the impression of a small shrub rose. The name make this variety the perfect birthday gift. Hardy. Good disease resistance. Grows to 75cm in height. A great gift idea to remember that special and important occasion whether happy or sad - Moment in Time Potted Rose delivered by mail order and presented in a ribbon-tied hessian gift bag with gift card with your personal greeting. ROSE OF THE YEAR 2012. This stunning variety produces a prolific amount of rich red blooms with a slight fragrance repeatedly throughout the summer into the autumn. Healthy, dark green and glossy foliage gets hidden by the sheer amount of blooms. Looks great either in the garden or a container. Hardy. Good disease resistance. A great gift idea for Mother's Day, a Birthday, Friendship, New Baby, Special Occasion or just to say Thank You - Mum in a Million Potted Rose delivered by mail order and presented in a ribbon-tied hessian gift bag with gift card with your personal greeting. NEW TO RUMWOOD NURSERIES 2014. A large flowering hybrid tea rose. Also known as 'Millie'. Beautiful, shapely, cupped blooms, clear pink in colour are produced repeatedly throughout the summer into the autumn. Blooms carry an exceptionally beautiful fragrance. Foliage is dark green and glossy with a good bushy growing habit. This rose makes the perfect mother's day gift or just a gift to give your special mum. Hardy. Good disease resistance. Grows to 100cm in height. A great gift idea for Father's Day, a birthday, Friendship, Special Occasion or just to say thank you - My Dad Potted Rose delivered by mail order and presented in a ribbon-tied hessian gift bag with gift card with your personal greeting. A large flowering floribunda rose. Large, fragrant, bright red, fully double blooms are produced throughout the spring into the autumn. Clothed in attractive dark green leathery foliage offsetting the blooms perfectly. A sturdy upright growing habit. The name making this variety an ideal present or reminder. Hardy. Good disease resistance. Grows to 75cm in height. A great gift idea for Mother's Day, a Birthday, Friendship, New Baby, Special Occasion or just to say Thank You - My Mum Potted Rose delivered by mail order and presented in a ribbon-tied hessian gift bag with gift card with your personal greeting. A slightly fragrant, floribunda variety with mid sized blooms. Unusual, attractive scarlet flowers with a silver reverse are produced freely throughout the flowering season. A shorter bushy plant with attractive dark green foliage. The name makes this variety the ideal present or as a reminder. Hardy. Good disease resistance. Grows to 90 cm in height. A great gift idea for that recently married couple to give lasting memories of that special day - Newly Wed Potted Rose delivered by mail order and presented in a ribbon-tied hessian gift bag with gift card with your personal greeting. A repeat flowering patio rose. Pink buds open to pretty little sweetly scented white blooms with an attractive yellow centre. Small glossy healthy foliage. A nice open spreading growing habit. Makes an unusual and wonderful wedding gift. Hardy. Good disease resistance. Grows to 60cm in height. A great gift idea to remember that special person or event to give long-lasting pleasure - Peace Potted Rose delivered by mail order and presented in a ribbon-tied hessian gift bag with gift card with your personal greeting. A large flowering Hybrid Tea rose. The most famous rose of all time. Slightly fragrant, dark yellow, edged pink blooms are produced throughout the summer and autumn. Vigorous dark green and glossy foliage. A large space to grow would be beneficial. Hardy. Average disease resistance. Grows to 120-150 cm in height. A great gift idea to help you remember that dearly beloved relative, friend or even a pet - Remember Me Potted Rose delivered by mail order and presented in a ribbon-tied hessian gift bag with gift card with your personal greeting. A large flowering hybrid tea rose. Slightly fragrant, well-shaped blooms of a deep copper and orange blend are produced freely in clusters throughout the summer through to the autumn. Vigorous upright growth. Foliage is dark green and glossy. Excellent bedding variety. Good disease resistance. Grows to 90cm in height. A great gift idea for that special and memorable day to give lasting pleasure and enjoyment - Remembrance Potted Rose delivered by mail order and presented in a ribbon-tied hessian gift bag with gift card with your personal greeting. A cluster flowering floribunda bush rose. Large trusses of slightly fragrant, scarlet-red flowers are borne repeatedly all season on strong upright stems. Foliage is a medium green and glossy nature forming a neat compact leafy mound. Makes an eye catching display of colour when planted en masse. Hardy. Good disease resistance. Grows to 75cm in height. A great gift idea for that 40th wedding anniversary celebration - Ruby Wedding Anniversary Potted Rose delivered by mail order and presented in a ribbon-tied hessian gift bag with gift card with your personal greeting. A repeat flowering patio rose. Small clusters of slightly scented, rich crimson blooms are produced repeatedly throughout the summer into the autumn. Foliage is dark green and glossy. Small and compact growing habit. Makes the perfect gift for that special anniversary. Hardy. Good disease resistance. Grows to 65cm in height. A great gift idea for that 25th wedding anniversary, to wish someone Congratulations or for any other Special Occasion - Silver Anniversary Potted Rose delivered by mail order and presented in a ribbon-tied hessian gift bag with gift card with your personal greeting. A large flowering hybrid tea rose. The flowers are both pure white and fragrant, and the plant is below average height - a combination that is unusual and desirable in a hybrid tea rose. Vigorous, upright, light green glossy foliage. Good disease resistance. Grows to 75cm in height. A great gift idea for that 25th wedding anniversary, to wish someone Congratulations or for any other Special Occasion - Silver Wedding Potted Rose delivered by mail order and presented in a ribbon-tied hessian gift bag with gift card with your personal greeting. A large flowering Hybrid Tea rose. Old fashioned, full spiral type blooms are produced freely throughout the summer until the autumn. Flowers are of a creamy white colour; blush pink on the outside, with a pale honey centre. Dark green glossy foliage tinted bronze when young. Perfect as a cut flower. Grows to 60cm in height. Spray regularly against disease. A great gift idea for Birthday, Father's Day, Friendship, Grandparents Day, Mother's Day, Romantic Occasion or to say Sorry You're Leaving - Simply The Best Potted Rose delivered by mail order and presented in a ribbon-tied hessian gift bag with gift card with your personal greeting. ROSE OF THE YEAR 2002. Official rose of the XVII Commonwealth Games. A large flowering Hybrid Tea rose. Magnificent burnt mandarin blooms are produced repeatedly throughout the summer into the autumn. Dark green, glossy foliage, red when new. Very good disease resistance. A must have for any garden. Grows to 75-90cm in height. A great gift idea for that special event or occasion - Special Occasion Potted Rose delivered by mail order and presented in a ribbon-tied hessian gift bag with gift card with your personal greeting. A large flowering Hybrid Tea rose. Beautifully formed blooms of a coppery/apricot colour are borne in a profusion from very early in the season to the first frost. Blooms are strongly scented. Foliage is dark green and glossy. Healthy vigorous growth. Ideal as a cut flower and bedding variety. Good disease resistance. Grows to 75cm in height. A great gift idea to remember that important person or event whether it is happy or sad - Sweet Memories Potted Rose delivered by mail order and presented in a ribbon-tied hessian gift bag with gift card with your personal greeting. A repeat flowering patio rose. Large clusters of well formed, soft lemon-cream blooms are produced repeatedly throughout the summer until the first frost. Slightly scented. Foliage is healthy, dark green and glossy with a neat and compact growing habit. Ideal as a memorial rose. Hardy. Good disease resistance. Grows to 60cm in height. A great gift idea for that special person or occasion - Sweet Remembrance Potted Rose delivered by mail order and presented in a ribbon-tied hessian gift bag with gift card with your personal greeting. A great gift idea to say thanks to that special or important person - Thank You Potted Rose delivered by mail order and presented in a ribbon-tied hessian gift bag with gift card with your personal greeting. A cluster flowering Patio rose. Masses of gently scented, double deep pink roses are borne in large clusters repeatedly throughout the summer into the autumn. Foliage is deep green and glossy providing a nice back drop to the flowers. A touching and thoughtful way to thank someone. Hardy. Good disease resistance. Grows to 60cm in height. A great gift idea to remember that special person to give lasting pleasure and memories - Thinking of You Potted Rose delivered by mail order and presented in a ribbon-tied hessian gift bag with gift card with your personal greeting. A large flowering Hybrid Tea rose. Classic, elegant hybrid style buds open up to a blood red, deep crimson velvety centred bloom. Blooms are well shaped. A nice fruity fragrance. Nice vigorous dark green glossy foliage. Nice, tidy bushy habit. Good disease resistance. Grows to 90cm in height. A great gift idea to wish someone congratulations for their exam test results or for any special occasion - Top Marks Potted Rose delivered by mail order and presented in a ribbon-tied hessian gift bag with gift card with your personal greeting. A great gift idea for a house warming gift for that new home or for any other special occasion - Warm Welcome Potted Rose delivered by mail order and presented in a ribbon-tied hessian gift bag with gift card with your personal greeting. A small patio climbing rose. Clusters of slightly fragrant semi-double blooms, orange-red in colour are produced repeatedly throughout the summer into the autumn. Foliage is small, red when young maturing to dark green and semi-glossy. Ideal for growing in a large pot up a trellis. Easy to train with flexible shoots. Ideal gift for someone in their new home. Hardy. Good disease resistance. Grows to 250cm in height. A great gift idea for an Anniversary, Birthday, Christmas, Engagement, Father's Day, Grandparents Day, Mother's Day, New Baby, New Home, Retirement, Thank You and Wedding - Warm Wishes Potted Rose delivered by mail order and presented in a ribbon-tied hessian gift bag with gift card with your personal greeting. A large flowering Hybrid tea rose. Beautiful well-shaped blooms of an apricot/peach blend are produced in clusters and singularly throughout the summer into the autumn. Exquisite fruity fragrance. Foliage is a dark green and semi glossy contrasting well with the blooms. Vigorous bushy growing habit. A rose every garden should have. Good disease resistance. Grows to 80cm in height. A great gift idea to wish that special couple congratulations on that special wedding occasion - Wedding Day Potted Rose delivered by mail order and presented in a ribbon-tied hessian gift bag with gift card with your personal greeting. A large rambling rose. Large trusses of single blooms with five petals, creamy white in colour that are produced en-masse in midsummer. Blooms are fragrant and are studded with golden yellow stamens. Foliage is dark green and glossy. Ideal for covering the front of a house or rambling through a large tree. Ideal as a gift to that special couple to commemorate their wedding day. Hardy. Good disease resistance. Grows to over 700cm in height. A great gift idea for an Anniversary, Birthday, Engagement, Friendship, Mother's Day, New Baby, Romantic, Special Occasion or Wedding - You're Beautiful Potted Rose delivered by mail order and presented in a ribbon-tied hessian gift bag with gift card with your personal greeting. ROSE OF THE YEAR 2013. An abundance of large heavily scented, well formed blooms, striking rich pink in colour are produced throughout the summer into the autumn. Exceptionally disease resistant healthy foliage. Has also been awarded the Gold standard award which is only awarded to a select few varieties. An easy to grow variety that will produce a great show for even the novice gardener. Hardy. Exceptional disease resistance. Grows to 60-90cm in height.